Wall Color: Room: Living Room Bedroom Size: 24" x 36"
This painting for the AAC theme show 2018 is of “The Natch” on the Petawawa River. Quite awhile ago in a September I canoed this river with my husband and we didn’t really know what we were getting into. After many rapids and spills we came out onto the campsight looking out onto the Natch cliffs. This scene always stuck with me as beautiful, dramatic and rugged just like the river we had just survived! 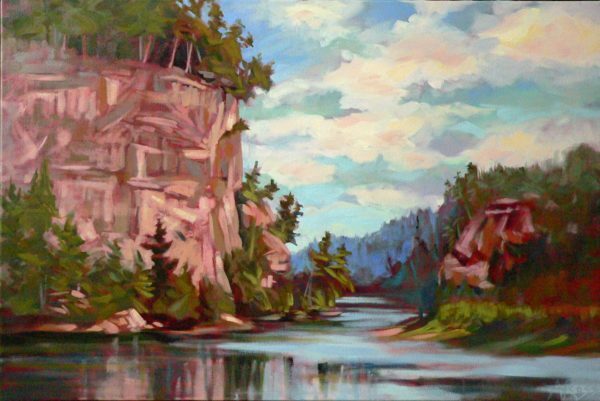 This is an oil Painting on canvas of a very recognizable spot on this magnificent river.